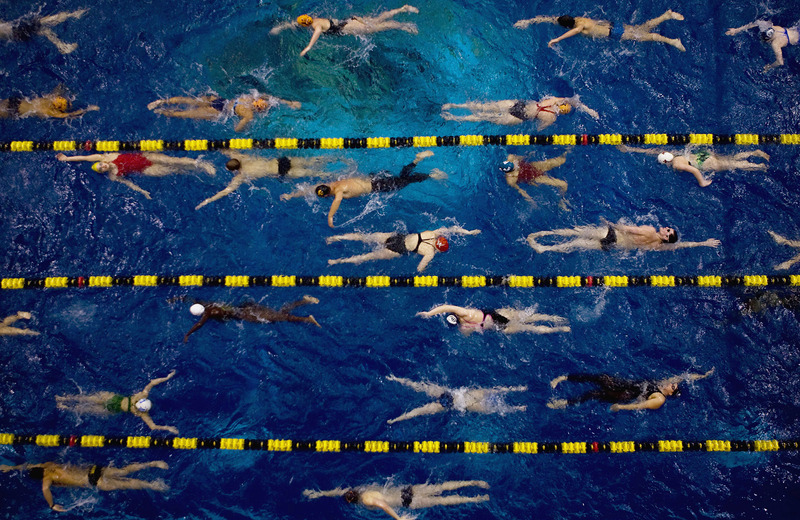 This is Championship Meet season, and many swimmers are gearing up for the year’s big races. We know from experience that some will do amazing, some will be disappointed, and many will be in between. Here are a few things you should keep in mind to get those amazing swims. 1. Sleep, eat properly, and remove stresses from your life. You want to arrive at the meet feeling good, and without any worries outside of the pool. If you have homework or studying to do, get on it early and make sure you’re comfortable with your effort. 2. Don’t radically change your diet right before the meet. Unless you are a nutrition expert (or you had an atrocious diet all year), you should keep to the same general diet you had all season. Diet modifications are sometimes used by higher level athletes, but only with expert guidance and some previous experience. The bottom line? It’s too late now to lose fat, or gain muscle mass, and too risky to make your first foray into manipulating carbohydrate intake. 3. Don’t add new physical activities to your routine now. At this point in the season your muscles have hopefully become fine tuned to your swimming races. Anything new can cause muscle soreness or muscle fatigue, and can even cause your stroke mechanics to change by compensating for the new aches and pains. 4. The days before the big meets are also not the time to make big changes to your stroke mechanics. Like it or not, fundamental changes to muscle memory are probably going to backfire. Even small change to stroke mechanics will most likely be lost during the excitement of the race. 5. The same thing goes for suddenly deciding you’re going to be an underwater phenomenon. It’s too late to radically change your underwater distance or speed. All that will happen in the race is that you’ll likely go into oxygen debt that your body isn’t prepared for. The same goes for changing your breathing pattern. If you’ve prepared for your race based on breathing on 3, the race is not a good time to experiment with breathing on 5 (or even going down to 2….). 6. Practice visualizing the race, from the point of standing behind the blocks to touching the wall. You can reinforce your good habits, improving your chances of doing the little things right during the race. This visualization should be part of the pre-race routine as well, allowing you approach the race with confidence. 7. Prepare properly for your meet sessions. Get up early enough to eat properly. Plan for the possibility of bad traffic or lack of parking spots. Find a spot to do your dryland wamup. And get in the water and get a good warmup even if the pool is insanely crowded. The idea is simple. Let NOTHING get in the way of your race preparation. If you have hours between warmups and your first race, or hours between races, don’t just sit like a lump for those hours. Make sure your body is ready to race when it’s time. 8. Trust your training, your strokes, and your meet preparation. Basically, don’t overthink this. Everything is in place for a good race. Focus on what you need to focus on, commit yourself to doing well, and let the rest of the race happen. 9. Stay away from race expectations. As I mentioned in a previous post about Goals and Expectations (here), goals are a long term process that involves working towards an outcome. Expectations tend to be only about a result, such as making an arbitrary time, or beating a specific opponent. The problem is that expectations can often be unrealistic, and not meeting an expectation can often affect a swimmer’s attitude toward later races. At this point in the season your strokes and training are locked in. You just need to focus on getting behind the blocks ready to swim, and then committing yourself to doing the best you can. Good luck! Next Post 200 Freestyle: Sprint or Distance?